Here’s another Costa Rican Wine and Cheese pairing for you to enjoy. This week’s wine hails from Spain but the cheese is from here. 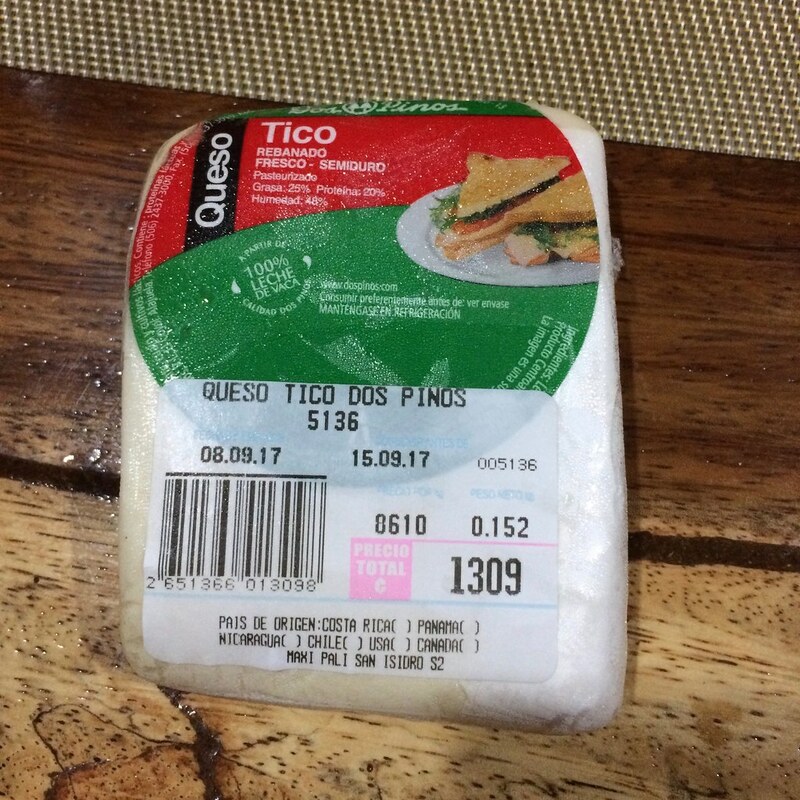 We found the cheese in our grocery store refrigerated case and it was simply called Tico Cheese. (The phrase Tico, typically refers to a person from Costa Rica, but hey, let’s give it a try). We’ve found a few Spanish wines during our trips here and Opera Prima is another new brand for us so we picked up a bottle. 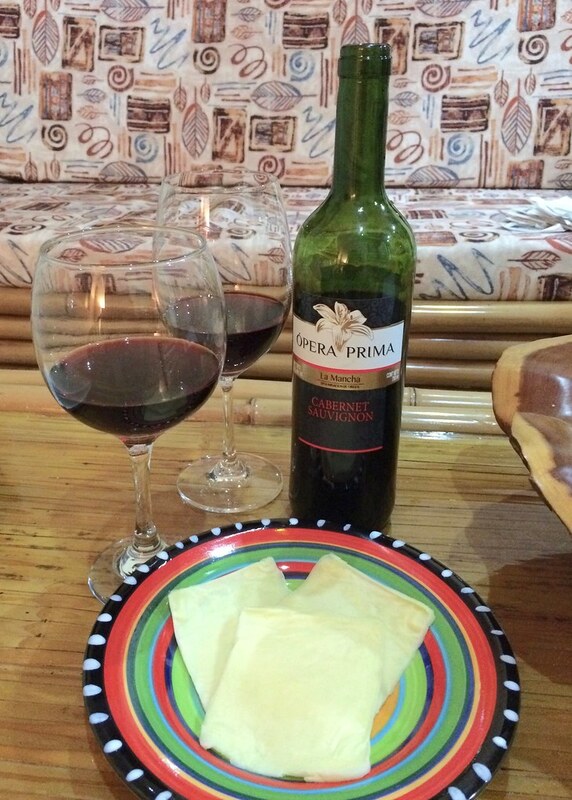 Without further ado, the pairing of Opera Prima Cabernet Sauvignon and Tico cheese. We couldn’t find a vintage listed on the wine bottle so let’s presume it’s a non-vintage wine. As soon as we opened the bottle, Neil said he could smell the fruit across the room. I agreed that there was a strong aroma of grapes jumping from the glass. Once we started officially swirling the wine to find aromas, I noticed grapes, dark fruit, black pepper, earth and a hint of black sharpie marker. Neil got more specific with his fruit aromas naming blackberries and cassis. He also picked up some spice and alcohol. The wine was on the lighter side with a dry flavor and spice. The color looked a little light too when I looked down through the wine. Neil found it to be an interesting Cabernet that wasn’t too big to enjoy. The cheese was not at all what I was expecting. As we mentioned in our previous entry, you never really know what you’re getting with Costa Rican cheese. There were multiple layers of Saran Wrap covering this cheese and once I finally got to the cheese, I discovered that it was a sliced cheese. Oh that’s what “rebanado“ means! Ok so we have a sliced cheese, that explains why there’s a sandwich on the label. This cheese smelled like butter and some salt. Maybe it’s similar to Fontina? Neil was also reminded of another type of cheese but couldn’t quite pinpoint it. Neil identified buttery flavors with almost no salt and a hint of grass. I thought the cheese was tangy and kind of sharp like a reduced fat cheddar that my mom likes. The flavor could have been similar to brie also? Or maybe that was just the creamy texture that reminded me of brie? Neil said that as he tasted the cheese it changed from fresh milk to a buttery flavor. As we combined the Cabernet Sauvignon and the Tico cheese, the wine smelled the same but the flavor was spicier and drier. The acid in the wine seemed to increase on my teeth, too. The cheese seemed to change for the better when it became thicker and richer. Neil felt the wine overpowered the cheese but the cheese made the wine a little lighter. Since the cheese changed to a sour milk flavor, he preferred the wine and cheese separately. We still had some wine left at the end of the night so we tried it again a few days later. The cabernet sauvignon had sweet berry aromas, a tart cranberry and earthy flavor with a sweet finish. I confirmed that I’m still not much of a cabernet sauvignon fan. Maybe there’s another wine region out there that I should try the varietal from? If I find one that I enjoy, I’ll be sure to write about it.